What do management teams look for when buying a new baler? Throughput speed, bale density, pressing force, motor power, footprint, energy consumption? In reality, the response to all of these factors is ‘yes’. However, like when buying a new car, television or smartphone, little beats testimony from a user who has already taken the plunge, and is prepared to vouch for their decision. This delivers confidence, which is vital in modern business environments where capital investments need to work hard in terms of performance and ROI. By way of example, Bird Bros, a Bedfordshire-based producer and packer of eggs, has been using an RWM75 baler from Riverside Machinery very successfully since 2007. This prompted the company to return to Riverside when a recent upgrade was required. Bird Bros ships three million eggs a week, a process that inherently produces a lot of waste packaging. The RWM75 acquired in 2007 was intended to better handle this volume of plastic, rather than relying on costly skips, producing three 75kg bales of plastic per week. This throughput generated a revenue yield which meant return on investment was experienced inside three years. However, as the firm has grown so has its volume of waste. As a result, following a recent £5 million investment in a new head office, packing centre and various renewable energy systems, Bird Bros decided that its recycling processes also needed upgrading. For this new challenge, Riverside recommended the RWM150, a medium-sized baler suitable for larger volumes of packaging waste. Since installation, the machine has been busy producing up to four 150kg bales per week. Indeed, the RWM150 offers a press force of eight tonnes, allowing bales of 1,000 x 975 x 800mm to be produced in cycle times as short as 40 seconds. 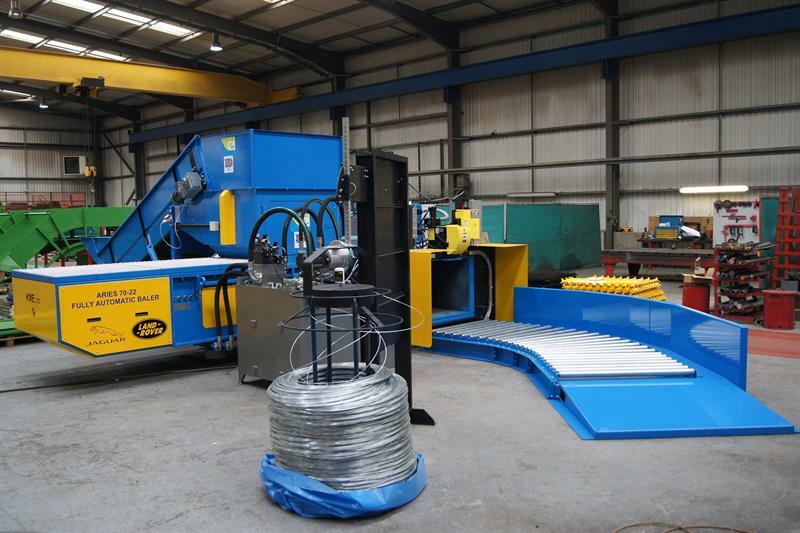 Arguably one of the biggest tests of a baling machine is at dedicated recycling companies, where machines are often working around the clock. Take Alresford, Hampshire-based Ecogen, for example, where throughput is increasing by as much as 10% month-on-month, making it one of the fastest-growing recycling firms in the UK. With focus placed firmly on continued expansion, the Ecogen team recently specified a Presona LP65 VH K2 cross-tie baler to increase material processing speeds and bale density, injecting an essential degree of future-proofing at this forward-thinking company. The new baler has increased Ecogen’s processing capacity from eight to 22 tonnes an hour, an improvement which the company says will enable it to become even more competitive when it comes to commercial waste purchasing. This is good news, as the company regularly processes up to 3,000 tonnes of paper, card and plastic a month, all from commercial sources. Ecogen bought its first Presona baler when it moved to the Alresford site two years ago. The LP50 prepress baler was used to bale cardboard, paper, plastic and shredded paper. Based on an average 500kg plastic bale, Ecogen has increased its container rate from 18-20 tonnes up to 24 tonnes, reducing logistics costs and making the company’s entire process more profitable. “In addition, we are now able to process material much quicker, filling up to 20 containers of cardboard a week,” says Mottram. Another dedicated recycling business, MDL in Sittingbourne, Kent has built up a successful business collecting non-mill-size bales from customers. The company then needs the materials to be reprocessed into mill-size bales quickly and efficiently. Capital Compactors & Balers met with the team and went through the options of supplying an APK E fully automatic baler to replace the horizontal baler currently in place. The APK E model has a 30kW motor that provides a pressure force of up to 700kN, and can be programmed to process the site’s various recycling commodities, which include paper, cardboard, PET bottles, cans and hard plastics. A longer channel press is fitted to give constant bale sizes and weight, while the APK’s novel cutting system prevents material jamming and reduces energy consumption by up to 40% in comparison with conventional systems, says the company. Furthermore, the fitted free press device means MDL’s continuous throughput demands are no problem as excess material is pushed away from the cutting edge. Blue chip, multinational OEMs are a further testing environment for the latest baler technologies. A case in point can be seen at automotive giant Jaguar Land Rover (JLR). Ken Mills Engineering was delighted when Voith Industrial Services made contact to discuss a solution to bale all the waste film and foam covering that is used to protect the components required to build the latest Land Rover Discovery Sport. After initial conversations, KME experts attended the site to assess requirements and recommended an Aries 70A twin-ram baler. The main challenge that KME encountered was that the design of the baler had to fit into an existing building with lots of other small vehicle movements. To resolve the size and space issue, KME engineered its machine to be smaller than standard, but without any compromise in performance, allowing the site to maximise its available working space. The next big challenge was to meet a very tight installation timeframe that coincided with JLR’s annual shutdown. This gave KME just seven weeks to design, build and install the machine from its official order date. Not to turn down a challenge, KME took on the project and delivered the machine in record time, meeting with the client’s shutdown ready for the start-up of the car production line. paper trim, cardboard, polythene sheet, textiles and foam scrap. With its 70 or 115 tonne pressing force, the machine produces a high-density bale of up to 700kg in weight. The machine is fully automatic and fitted with the Accent 470 wire-tying device with a capacity of up to 20 bales per hour. This solution is clearly proving popular, as the St Ives facility of Mick George, an independent waste management provider to the commercial, industrial and domestic sectors, has also recently installed an Aries twin-ram baler, this time the 115 tonne model. Clearly, recommendation counts for a lot. manufacture breakdown and repair parts at customer sites. With the aim of reducing baler downtime, the company is set to investigate the process of training staff and requirements for fitting out vehicles with the necessary technology to produce a range of specific machine parts other than standard consumables. Carried out by Whitham Mills’ engineering team, the study will be used as a test-bed designed to accelerate repair times by enabling every maintenance vehicle to, in theory, 3D-print components on demand. 3D printing has developed to the point where parts can now be made from metals such as stainless steel, titanium and cobalt chromium, in addition to more conventional plastic polymers.